Today Frankie got his first ribbon! 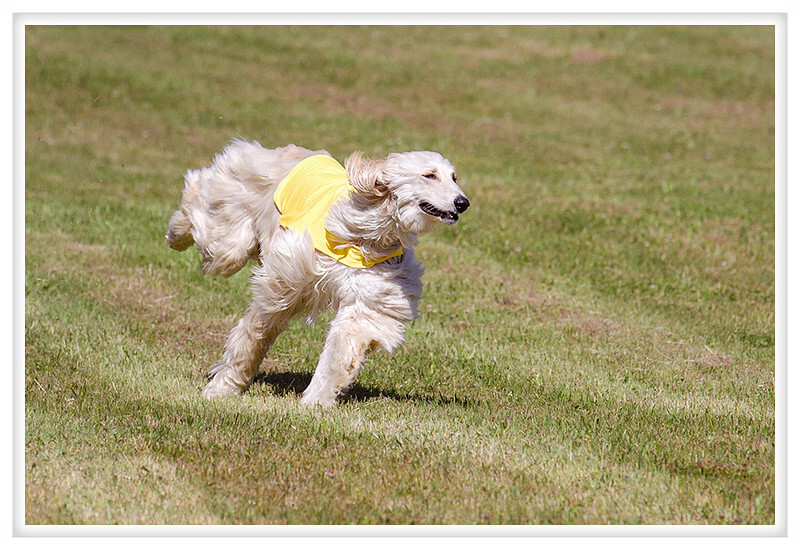 We went lure coursing which is much more suited to his style of running, beautiful but slow. It is a very subjective thing but it isn't all about speed which means he was able secure the ranking of next best qualified; it means he came in fifth in a very competitive field including some of the best racers in the country. It was an all breed event so we had some whippets, an Italian greyhound, a couple of Rhodesian ridgebacks, and an afghan hound. His name is Lil Mo and he is a bit of a chicken. At check in Mo had to let someone other than Mom touch him which he found rather traumatic but he chased really well. Given the heat Mo has been partially shaved and looked much like a giant Fraggle running around the track. I wish there were more muppets to race because I like taking their pictures.